The gardens at Polesden Lacey are the creation of Mrs Greville, the renowned society hostess. 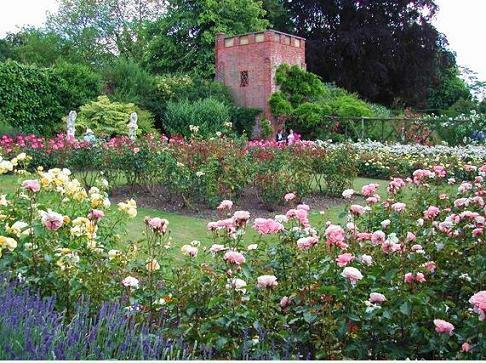 Situated within the North Downs landscape the Polesden Lacy Gardens are Edwardian in style with colourful herbaceous borders, a walled rose garden and fine statuary. In autumn enjoy the striking colours of the far reaching landscape and in spring the garden is full of flowering bulbs. The Winter Garden at Polesden Lacey was designed in the 1950's by Graham Stuart Thomas, Gardens Adviser to the National Trust for over 20 years. In fact, it was the sole basis for his 1957 book 'Colour in the Winter Garden'. The garden itself, still much as Thomas left it, is dominated by a wide central bed of bright yellow winter aconites (Eranthis hyemalis), interspersed with a variety of pure white snowdrops (Galanthus sp. ), some dashed with streaks of green or yellow. Three Persian ironwood trees (Parrotia persica) form the centrepiece, drawing the eye upwards to a dark canopy of crimson buds. The outer beds are filled with scented shrubs such as Sarcococca hookeriana var. digyna and Mahonia nitens as well as the likes of Hellebores, Viburnums and Stachyurus chinensis. Polesden Lacey is open all round, with the Winter Garden tucked away in a quiet corner of the formal gardens behind the old Head Gardener's Cottage. We plan to carry out some restoration and replanting in there next year so in Winter 2017/18 it will be looking even more beautiful. Make some time to visit the house with its collection of porcelain and art with many of the rooms laid out largely as they would have been when Mrs Greville hosted a dinner party for Edward VII. 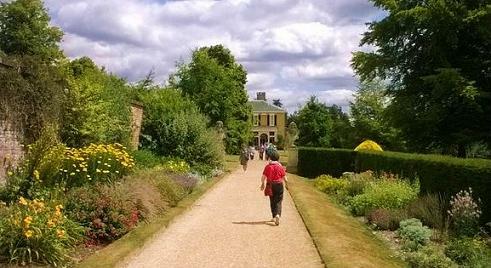 With a children's play area and activities for the children the whole family will enjoy a visit to Polesden Lacey. 2019 - Polesden Lacey Garden - normally open daily throughout year. Please visit our website for admissions information and opening times. Tea Room, shop, partial disabled access. If you want tofind places to stay near Polesden Lacy, why not stay in one of our recommended hotels. Each hotel has genuine guest reviews enabling you to book from anywhere in the world in total confidence. Not only do we feature hotels near the garden, we also feature hotels worldwide and at all major airports. Special prices up to 70% off standard rates as well as hundreds of exclusive deals. Look now - click here.